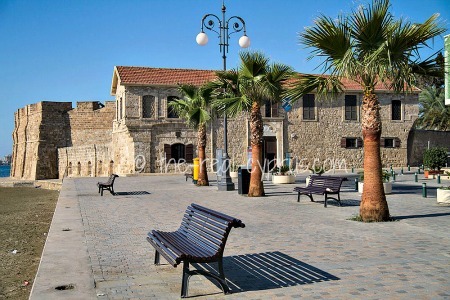 Larnaca Castle is situated on the coastal avenue in the town known as Phinikoudes or Finikoudes, avenue of palm trees. You cannot miss this wonderful stone building as you walk along the promenade (phinikoudes), it sits, welcoming you at the southern edge of the town. 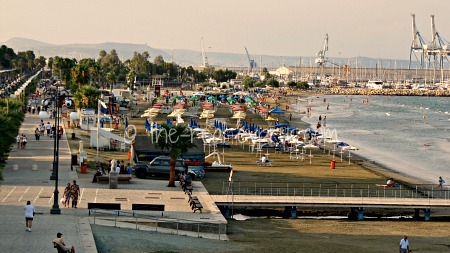 Records were kept by an Abbot who lived in Larnaca during the first half of the 18th century. Giovanni Mariti, the Abbot, wrote it was built by the the Ottoman Turks, used as a garrison but was in a semi ruinous state at the time he was recording the information. Going further back from him, others had written that the castle could be dated to a period of 1382-1398, the reign of King James. 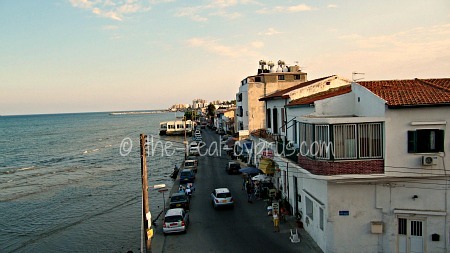 Apparently, according to the sources before the Abbot, the castle was built to protect Larnaca. Famagusta, just along the coast to the east was used as the main port, and after it had been captured during this period in history, Larnaca then became the premier port of the day. Using local stone, the North side of the castle consisted of a two-storey building, built in Ottoman style, and there is a Turkish inscription above the main entrance. 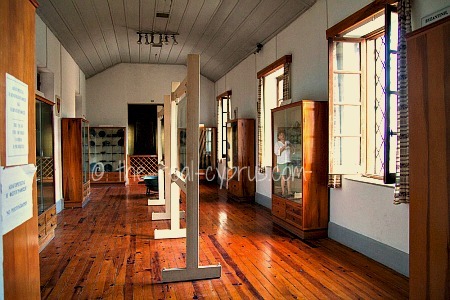 You will see 2 rooms constructed, on the East, it now houses the ticket office and on the West it leads you to the gallows area, used by the British for executions during the colonial period. They were used right up until 1945. There are historical explanations and line drawings exhibited on the walls, like paintings. A porch connects the two rooms and it opens right into an inner courtyard with a garden and performance space. A stage is currently constructed with chairs in here. 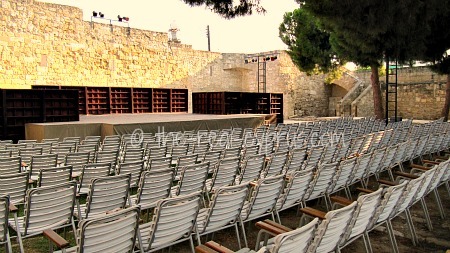 Outside, you can access the upper storey, home to the District Medieval Museum of Larnaka. 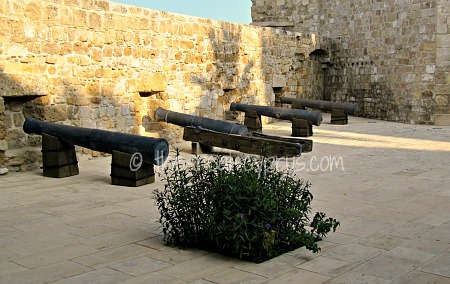 In the Northern half of the East side of Larnaca Castle, are a number of cannons said to date from Medieval period, they are perfectly preserved and make for a great photograph, and small children particularly, are fascinated by them. The Southern half of the East side, which belongs to an earlier phase of building, consists of a semi circular apse on the inside, but turns into a rectangular shape on the outside. Tombstones here are displayed from Gothic churches in Nicosia and they date from the 14th century AD. The South side of the castle also belongs to this earlier building period and has a series of rooms covered with a pointed arch. In the first couple of rooms you will see more of the tombstones and inscriptions, and on the western most edge is the oldest phase of the building. A staircase at this end, next to the rooms with the cannon balls (as shown) leads up to a flat roof at the top of the South East tower. If you go up here you will get a magnificent view of Phinkoudes and the beach on one side and the old Turkish part of town and seafront road on the the other. You can also see the Kebir Mosque right next door, so bring your camera for some excellent photographs from the top of the building. 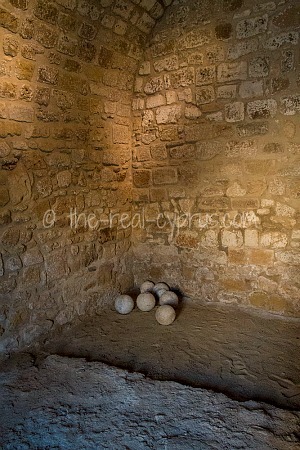 Larnaca Castle Museum is located on the upper storey of the main building, accessed by a staircase on the outside of the building, as you come in the entrance to the Castle and stand in the courtyard area. It is very plain to see where is is, there are 4 rooms, and as you come in the door the first room on the left has on display, various architectural items from other early Christian basilicas. They date from the 4th to 7th century AD. In the other rooms you will see antiquities from the early christian period such as glass and clay items, marble inscriptions and stone bread stamps. Photographs are also on display of early christian, byzantine and medieval monuments around Cyprus from the 4th to 16th century. The display in the main room (see photograph above) has some excellent examples of pottery, cooking utensils, weapons and soldiers helmets. 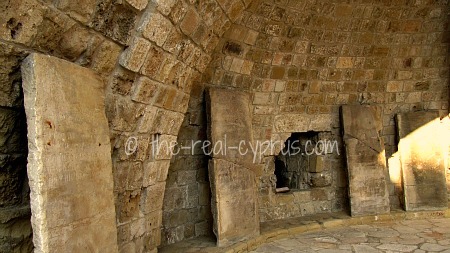 Photographs are on display of medieval fortifications around Cyprus plus Gothic and Renaissance style architecture found on the island as well. 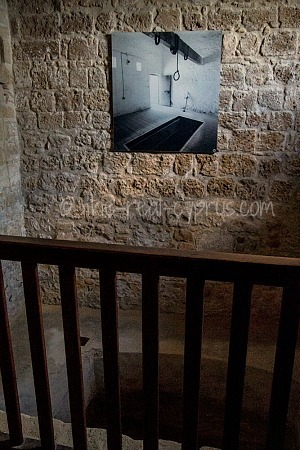 At the top end of this room in Larnaca Castle is an ottoman Ontas (seating area) complete with appropriate furnishings. As well as being a marvellous museum today, Larnaca Castle is used for various cultural events throughout the summer and they attract a large number of visitors. If you are lucky your visit might coincide with an event.